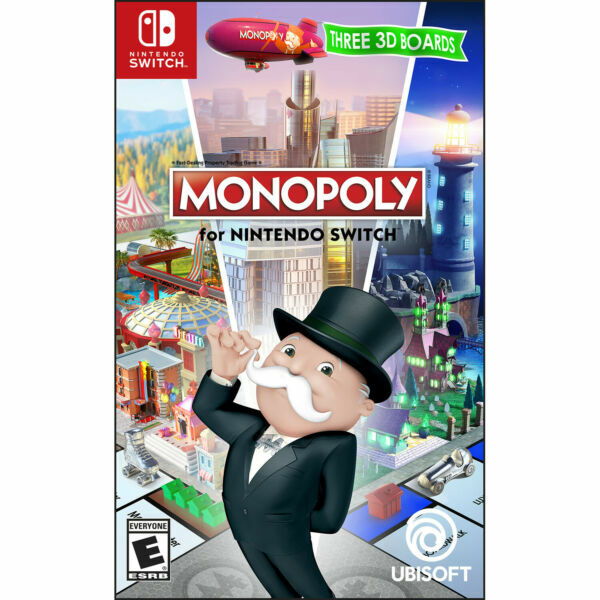 eBay Powered by Frooition About us Shipping Returns Contact us Our Reviews Promotions Monopoly for Nintendo Switch Shop Categories Helpful Links Add to Favorite Sellers Sign up to Newsletter View Feedback Contact Seller Visit seller's eBay Shop About Seller Page Monopoly for Nintendo Switch Item Description America's favorite family board game, MONOPOLY, makes its debut on Nintendo Switch system with new ways to play!Experience three unique 3D boards at home or on-the-go with up to six players in total, or take your game online and challenge players in quick matches. Customize your game by selecting from six official House Rules chosen by MONOPOLY fans around the world. Don't have time for a full game? Speed it up with Special Goals that shorten play sessions, and Actions Cards to move you around the board and penalize your opponents. Build your empire and trade your way to victory!Features:Choose from three 3D boards and watch as the city lives and evolves as you play.Take your game wherever you go with Nintendo Switch, at home on your TV screen or on-the-go in tabletop mode.Play your way by selecting from six official House Rules chosen by MONOPOLY fans around the world.Finish games faster with options for shorter play sessions and choose objectives to switch up the rules.Change your luck with new Actions Cards that will penalize your opponents or move you around the board.Game Variation:Actual product received could be slightly different than what picture shows. To clarify the main photo may show the standard edition but you could actually receive the Greatest Hits, Platinum or a store specific version e.g. Walmart exclusive or Best Buy exclusive. Game Manuals Certain publishers have opted not to include physical manuals. If you do not find a manual please visit the publishers website for a digital version. You May Also Like More Items!View more great items Video Games Game Consoles Accessories Toys 2 Life Last Chance About us Shipping Returns Contact us Our Reviews Powered by Frooition Frooition | No-js Template | eBay design, eBay store design, eBay shop design, eBay template design, eBay listing design (ver:froo_no_js) This listing is currently undergoing maintenance, we apologise for any inconvenience caused.